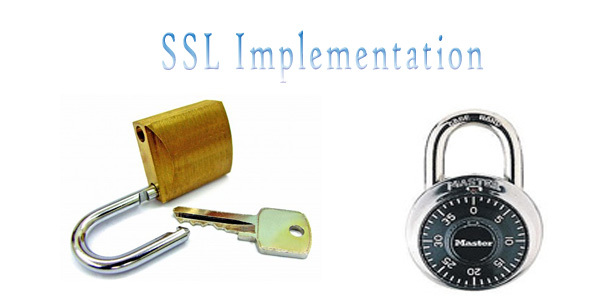 SSL Implementation : SSL (Secure Sockets Layer) enable your site with easily implemented standard protocol for transaction security - is an encrypted link between your Server and your Customer's browser. Once the link is established all communication between your Server and your Customer's browser will remain confidential. As the value of e-commerce / online portals continues to increase, Trust and Security become a critical differentiator is the market place. It is essential to any success business that all custom droppers. Credit card fraud and identity theft are two of the gravest concerns for any Internet user. As such, most internet users refuse to enter their personal information on unsecured sites. The ability to provide your customers with the certificates they need to secure their sites can set you apart from other hosting providers.With a A2Z Computex, you can get SSL Certificates to get confidence of your prospects and a result converting them in customers, This SSL allow them to safely run sites that permit users to enter usernames, passwords, personal information, or even credit card numbers. Features : A variety of SSL Certificates to choose from (RapidSSL, QuickSSL and QuickSSL Premium). All Certificates incorporate True Site technology with the functionality of a 128 to 512 bit SSL certificate. Third party validation is indicated by a patented "Smart Seal" technology that resides on your clients' sites. Benefits : The renewal process for SSL Certificates is streamlined, allowing for easy and efficient reordering. Userfriendly management through the ResellOne.net Reseller Interface. Customer confirmation and renewal messaging. Information entered into a user's browser can be transmitted securely to your customer's site. Certificate is provisioned in less than 10 minutes. Can be registered from one to three years. Intended for sites conducting low volume commerce. Information entered into a user's browser can be transmitted securely to your customer's site. Certificate is provisioned in less than 10 minutes. Can be registered from one to three years. Compatible with 98% of browsers.